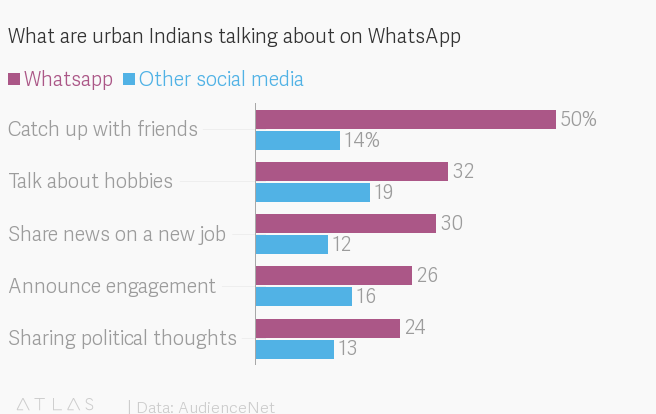 Indians are living their lives on WhatsApp. The world’s most popular instant messenger, with over 250 million users in the country, is being used by Indians for all kinds of conversations. While catching up with friends was the most popular use (over 50%) of the app, it is also commonly used to discuss hobbies, and even to make life-changing announcements such as securing a new job or getting engaged. The survey was conducted in February by the social and consumer research company AudienceNet among 1,520 urban Indians aged 18 years and above. 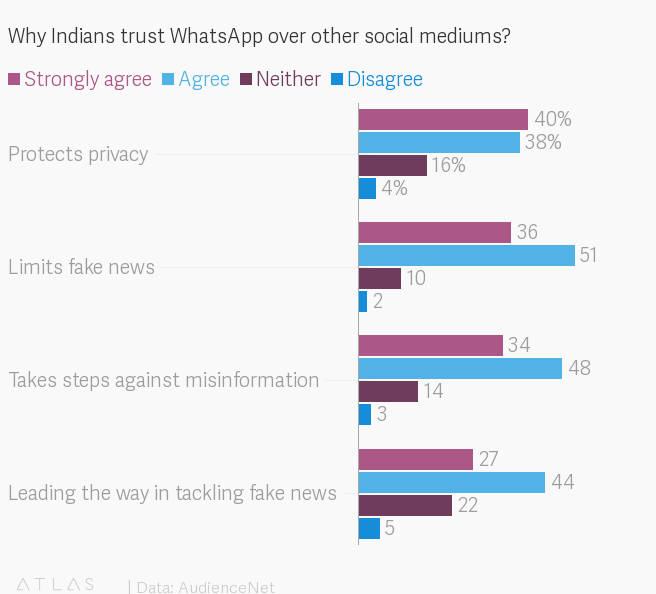 Not just personal information, Indians also trust WhatsApp with sensitive business data, using the messaging service to communicate with customers in India and abroad. Over 60% said the platform has helped them increase sales. Its payment system, awaiting regulatory approval in India, will further boost its use by businesses. One reason for this preference for WhatsApp is the security it offers. Messages on the platform are encrypted, which means a readable text is protected by a code and locked with a decryption key that makes it practically unhackable. The company had earlier said it was unable to prevent spam messages on the app as it can’t see the content of private, encrypted messages. Nearly 80% of the respondents said they trusted the app to keep their personal information private and secure, amid rampant data leaks and security breaches on other platforms. It’s ironic that Indians show immense faith in WhatsApp at a time when the Facebook-owned company has been under fire for spreading fake news and rumour mongering. In recent months, the Menlo Park, California-based firm was even pulled up by the Indian government for not doing enough to curb fake news. To tackle the problem of misinformation, potentially threatening India’s upcoming elections, WhatsApp has taken several steps, including restricting message forwards to only five people in one go. Last year, the platform launched an advertising campaign in major Indian newspapers to tackle the spread of misinformation that had prompted mob lynchings. It also launched safety features, including a label to distinguish forwarded messages and controls for group conversations. On Tuesday, WhatsApp went a step further and launched a tipline in a tie-up with fact-checking organisations Proto, Dig Deeper Media, and Meedan. The feature allows users to flag content, in various local languages and the tipline will classify the messages as true, false, misleading, or disputing. Over 80% of the respondents in the AudienceNet survey said they are aware of the steps WhatsApp is taking.